Nine in blister - Worldwide shipping. This article will appear at the end of August 2017. Shipped with tracking in a cardboard box. Warning: this edition does not contain a French version. Thank you for your consideration. That the date of publication may be delayed. The delivery time from China to my home. So thank you for being patient. If you do not agree with this, please do not buy this item. English (other languages ​​not confirmed). English (other subtitles to be confirmed). (A & b to be confirmed). Technical specifications subject to modifications. This item will be released at the end of august. The release date may be delayed. So thank you for being patient. English (other to be confirmed). (A & b to be confirmed). 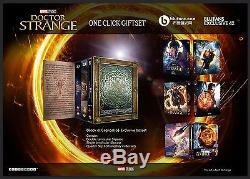 The item "doctor strange wea steelbook 3d / 2d blufans exclusive # 42 one click box (china)" is for sale since Saturday 22 July 2017. It's in the category "dvd, cinema \ dvd, blu-ray". The seller is "korbendallas38" and is located in brézins. This item can be shipped anywhere in the world.